BAKERSFIELD, Calif. — The largest construction project in the nation has hauled to a slow stop Tuesday. "The current project as planned would cost too much and respectfully take to long. There has been too little oversight and not enough transparency. Right now there isn't simply a path, to get from Sacramento to San Diego let alone from San Francisco to LA," said California Governor Gavin Newsom in his State of the State speech. The California High-Speed Rail Project was designed to connect San Francisco to Los Angeles in under three hours, but Tuesday Governor Newsom scaled back the project. "The Governor had to make some tough calls, do we abandon it in place or do we put something in place that can be useful? Certainly, I support his decision to come to Bakersfield, it will benefit the local community if and when it is built," said Ahron Hakimi the executive director of the Kern Council of Governments. 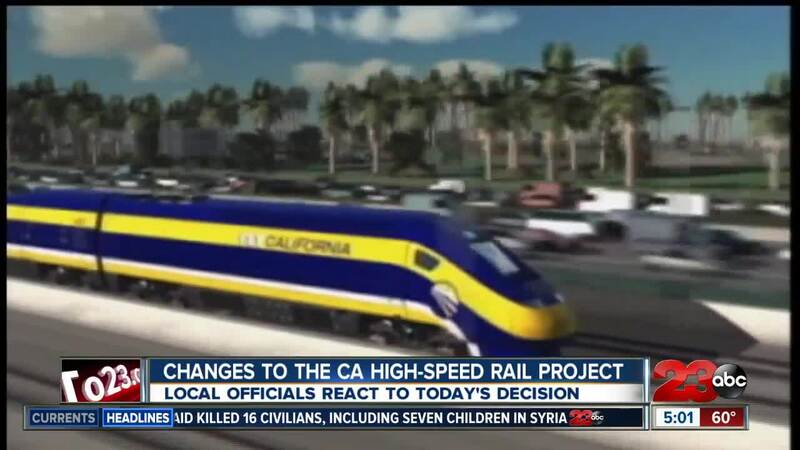 Governor Newsome said the High-Speed Rail will now only stretch from Bakersfield to Merced. He said he hopes that building the line could bring economic transformation to the agriculture region. Since 2008 the cost of the project has ballooned to $77 billion and has been behind schedule with the latest estimate for completion was 2023. The High-Speed Rail Authority released this statement, "We welcome this direction and look forward to continuing the important work on this transformative project." No information has been released on how much this reduced project will cost, but the Bakersfield station is still planning on being built at F Street and Golden State Avenue.